We are a top ten lender of FHA government mortgage loans. FHA program requires only 3% down payment and 620 credit score. FHA has more flexible underwriting guidelines for borrowers who have less than perfect credit and financial situations. There are no income restrictions but there are mortgage loan amount limitations for each county in the United States. Please check limits for FHA mortgage loans here. You don't need any of your own funds and your down payment can be a 100% gift from a family member or you can use grant or down payment assistance programs. The seller can pay for most or all of the closing costs. 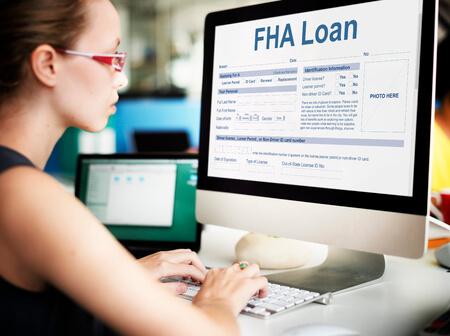 FHA program takes into account each buyer's extenuating circumstances such as job loss, long-term illness, and death in the family as legitimate reasons for credit issues in the past and we can manually approve these types of file on a case-by-case basis. A first time home buyer can purchase a home from their parents and use the equity in the home for down payment and closing costs. For example, your parent's home is worth $150,000 but they are willing to sell it to you for $140,000. You can use the $10,000 difference or equity to cover down payment and closing costs. We should point out that if the home appraises for less than the agreed upon selling price then you will need to come up with some cash for closing. This program allows you to purchase a fixer upper home or foreclosure and roll in repairs or improvements into the mortgage. The loan is based on the appraised value after the improvements have been completed and you only need a 3.5% down payment. Visit FHA Streamline Renovation Program to find out more about our streamlined FHA rehab program with easier qualifying guidelines and less steps to fix up and close on a home which needs some tender loving care. You can purchase a HUD owned property or FHA Foreclosure with $100 down payment than standard FHA program and the seller can pay for some or all of the closing costs.Eligible states include: Alabama, Florida, Georgia, Illinois, Indiana, Kentucky, Mississippi, North Carolina, South Carolina, Tennessee.Single family, 2 to 4 mulit-unit, PUD, and HUD or FHA approved condo projects, and homes located in disaster areas are eligible. Find Foreclosures Now! Please contact us at 847-305-3162 or email Dream@FirstHomeBuyers.net if you have questions or want more details on these great programs. Please apply for FHA mortgage if you would like to get pre-approved today for this program.